Siva, the last of the Trinities is the God of destruction & he is assisted in this by his consort Parvathi, the Goddess of disintegration. Parvathi represents Shakti, to disintegrate perishable matter, in the absence of which true and complete destruction by Siva becomes impossible. This could possibly be the meaning of the idea that Siva becomes nothing in the absence of Sakthi. Siva is generally worshipped in the form of the phallus (linga) fixed on a pedestal. Energy can neither be created nor destroyed & the Linga symbolises this scientific fact. The Linga denotes the primeval energy of the Creator. At the end of Creation all Gods find their resting place in the Linga - Brahma being absorbed into the right, Vishnu being absorbed into the left & Gayathri Devi being absorbed into the heart of the Linga. Linga, the emblem of Siva is the main form worshipped in Siva temples. Siva in his human form is worshipped as the Utsava murthi, taken out on processions. Siva Lingams worshipped in temples are mostly made of stone & consists of three parts. The lowest portion in the shape of a square symbolises Brahma (the God of Creation). The middle part in the shape of an octagon symbolises Vishnu (the God of Maintenance). These two portions are embedded inside a pedestal. The cylindrical portion projecting from the pedestal symbolises Shiva the God of Destruction). Siva resides high up on snowy mountain ranges. 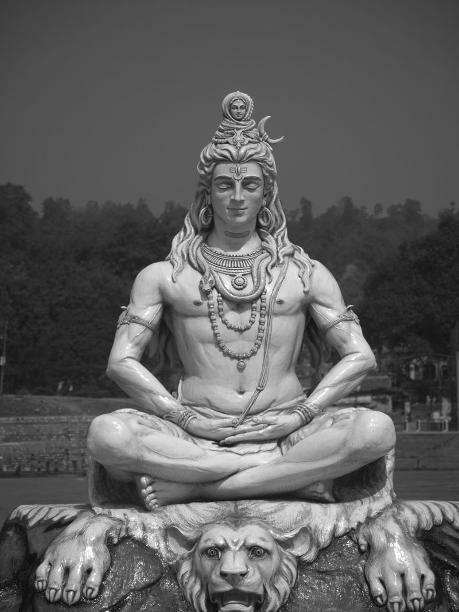 Image of Siva in his physical form presents him as a soothing meditative figure. His ornaments are not gold & precious stones. He wears a necklace made of skulls signifying his role as destructor. He has snakes coiling all over his body & his hair is matted and long extending over the whole sky & space. The crescent moon adorns his crown, signifying his control on the time cycle. (Amavasay & Pournami). He smears his body with ashes & wears a tiger skin and elephant skin. He has a third eye on his forehead which is the source of knowledge & wisdom. The holy Ganges is imprisoned in his flowing locks. In his two arms he holds the Trisulam (the three prongs representing the three gunas of sattva, tamas & rajas) in one & Damaru in the other. His vahana is the Nandi, who is also his chief disciple to whom Siva passed on all his immense knowledge in arts.